Azamara Club Cruises has revealed further details of its forthcoming refurbishment of Azamara Quest and Azamara Journey during a ship visit in Southampton. Richard Twynam, Managing Director UK and Ireland, Azamara Club Cruises, escorted journalists around Azamara Quest and explained the cruise line’s ambitious plans for each of the spaces on-board. In terms of décor the most significant change will be the lightening of the dark wood panelling that is used abundantly around the ship. The intention will be to create a light and airy feel through the use of contemporary interior design and a colour palate of creams and pale browns. Every public space and restaurant will be renewed with at least new curtains, carpets, and soft furnishings. Structurally the biggest changes will be to the spa and gym, as well as to Windows Café buffet restaurant. In the space currently occupied by eConnections, a computer room, two new Spa Suites will be added adjacent to the existing spa and will each feature a private balcony with whirlpool tub. Access to the spa will be moved to the opposite side of the ship, cutting into the space currently used by the gym. The spa itself will be renamed to ‘Sanctum’ and will be completely redesigned in line with the new contemporary décor used throughout the ship. The outdoor seating area of the Windows Café buffet restaurant will be transformed into Kibo, a new pan-Asian restaurant that will offer fusion food inspired by dishes from China, Japan, Korean and Thailand. The speciality a la carte restaurant will only be open for dinner at a $25 per person cover charge. The outdoor space will remain freely accessible to buffet guests throughout breakfast and lunch. Pervasive WiFi Internet access will be installed across the ship and while the Connections room will be removed a small number of computers will be relocated near Guest Services for passengers who wish to use them for Internet access. 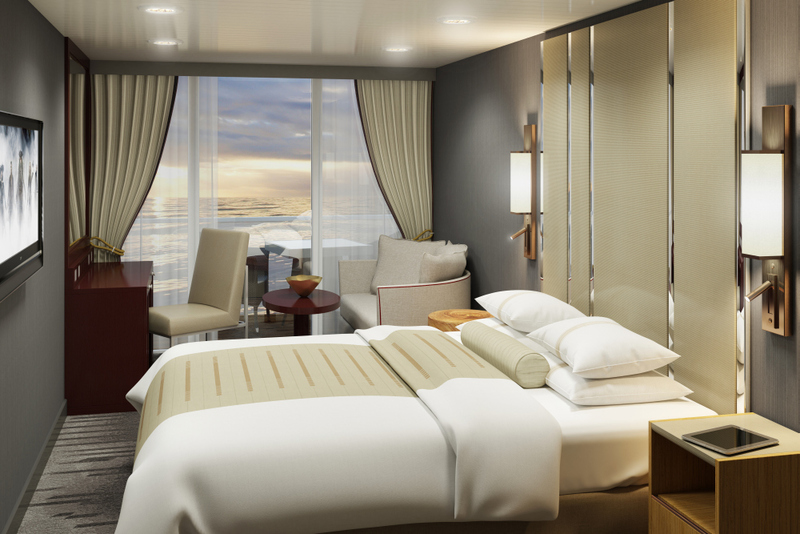 Every suite and stateroom will benefit from an update with new beds and a new contemporary colour scheme. A complimentary tapas bar will also be added to one side of the Looking Glass lounge. Twynam refused to divulge the estimated costs for the renovation work across both cruise ships although the investment is understood to be significant. Azamara Journey will enter dry dock in January 2016 in the Bahamas, and the Azamara Quest in April 2016 in Singapore.